The Multi-stage Filter is easily hidden away from view. The Multi-stage Filter comes with stackable trays with handles that collapse in on themselves for easy care and maintenance. If you consider yourself a hobbyist the Marineland C-Series Multi-Stage Canister Filters are right for you. Because they come in four different sizes these filters are perfect for any medium to very large aquarium; however it is best used in large (75+ gallon) tanks filled with a large fish community. If you have or are looking at creating a large Saltwater/Reef fish community this filter was designed for you! The Multi-Stage Filters ensure a healthy environment with crystal clear water for you and your fish to enjoy. 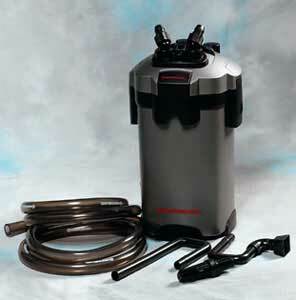 If you consider yourself a hobbyist the Marineland C-Series Multi-Stage Canister Filters are right for you. Because they come in four different sizes these filters are perfect for any medium to very large aquarium (30-150 gallon) tanks filled with a large fish community. If you have or are looking at creating a large Saltwater/ Freshwater community this filter was designed for you! The Multi-Stage Filters ensure a healthy environment with crystal clear water for you and your fish to enjoy. Each Marineland C-Series Multi-Stage Canister Filter is designed with an effective easy 3-stage filtration system consisting of biological chemical and mechanical filtration. The BIO-Filter Balls were designed to grow the beneficial bacteria that are needed for biological filtration and have been proven best at removing toxic ammonia and nitrites. Unlike our other canister filters the Marineland Multi-Stage Filters have no bypass option meaning that they only have the ability to produce clean water. The replaceable media slots provide the mechanical and chemical filtration screening out the dirt and debris and removing odors discoloration and impurities. The 100% water to media contact ensures a crystal clear healthy environment for your plants and even for the dirtiest of fish like Cichlids and Oscars. This type of 3-stage system along with the lack of a bypass option will guarantee that your aquatic environment thrives to its highest ability. 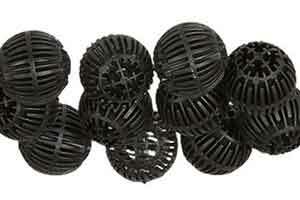 BIO-Filter Balls offer that Biological extra step in the Filtration Process. 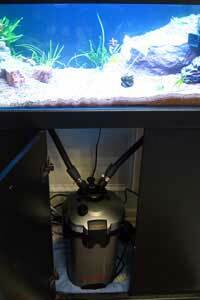 Despite the looks of complexity these Marineland C-Canister Filters are quite intuitive to set-up. 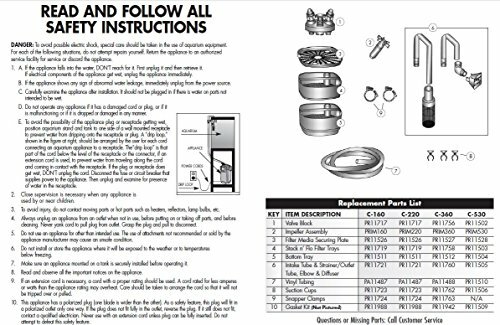 They come with printed instructions as well as a DVD manual to guide you along during the set-up process. These filters offers various media options giving you control of what kind of chemical filtration you would like to use with your tank. This will guarantee that your filter to starts out at maximum efficiency. Once the water flow throughout the filter begins to slow down you'll know that it is time for maintenance. The maintenance is simple and painless and should take up very little of your time. You never have to change the Ceramic Rings and BIO-Filter Balls unless they get damaged. 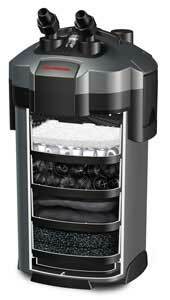 The only products that get changed monthly is the Activated Carbon and polishing pads. Marineland had made it simple to take apart the filter as well because the different media trays have collapsible handles and guides for easy take out and replenishment. Sign up for TetraCare® to help you be successful in your fish-keeping endeavor. This is a totally free program with the purchase of these aquarium systems and provides on-line and over the phone support. Once you register you'll receive specially timed e-mails to guide you through the first six months of your aquarium experience and beyond. Free direct access to our TetraCare® Team is just a phone call away. Just call 1-800-423-6458. Help is available seven days a week.